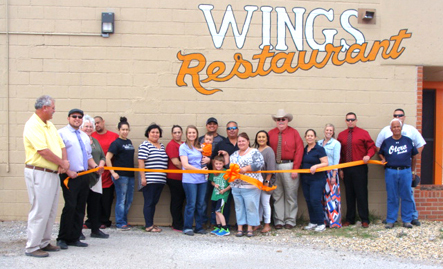 Members of the Artesia Trailblazers and Artesia Chamber of Commerce, along with Darlene Chavarria, center, new owner of Wings Restaurant, and members of her family and staff cut a ceremonial ribbon celebrating the change in ownership. Wings, located at 402 N. First St., is now open from 6 a.m. – 2 p.m. Monday through Wednesday, 6 a.m. – 2 p.m. and 5-8 p.m. Thursdays and Fridays, and 6 a.m. – 8 p.m. Saturdays. Contact them at 746-4288.